Although I am sad summer is winding down, I look forward to Fall in the Midwest. It is a beautiful time of the year. I love the cooler weather, bonfires, and most of all, the colors of Fall. When Pat and I decided to take some pictures from my house, I asked her if she thought it was too soon to start decorating for Fall. We decided, since Autumn will be here before we know it, let’s go ahead and start with Fall decorating ideas. You will see many handmade decorations in our homes. That is because we recently started a business called SistersCg. SistersCg has been a dream of ours for many years. All of our items are handmade. You can pick the color you want or specify the saying on the burlap bags (which will be featured in our next blog). All you have to do is let us know exactly what you want. If you are interested in any of the items with the SistersCg tag, let us know. You can contact us at sisterscg@yahoo.com, we are on Facebook – SistersCg, or just email us here at homeongrangehallroad@gmail.com. My mother-in-law bought the antique kitchen table at an auction. It sat in her kitchen for many years. I remember her making noodles from scratch, rolling them out on this little table, cutting them and letting them dry. She was a wonderful cook. I picked some beautiful black eyed susans and put them in an old Mason jar. They make the perfect simple country centerpiece. 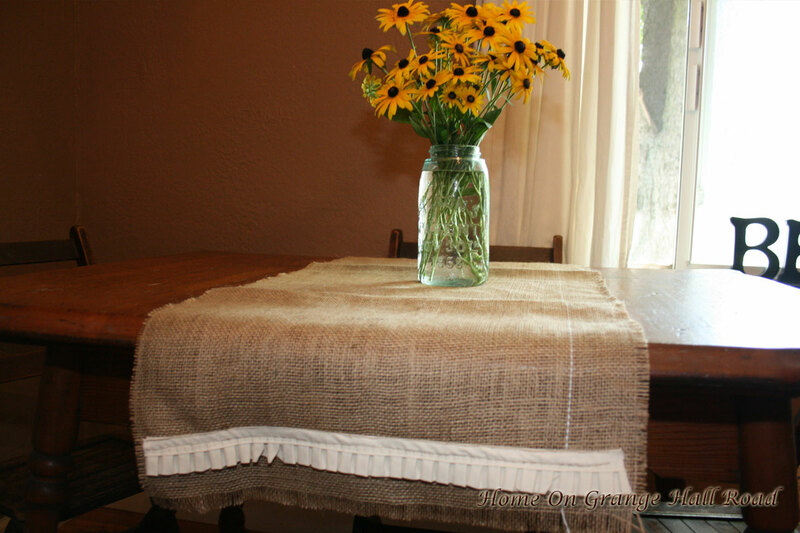 The burlap and muslin table runner (SistersCg) was made by my very talented sister Pat!! 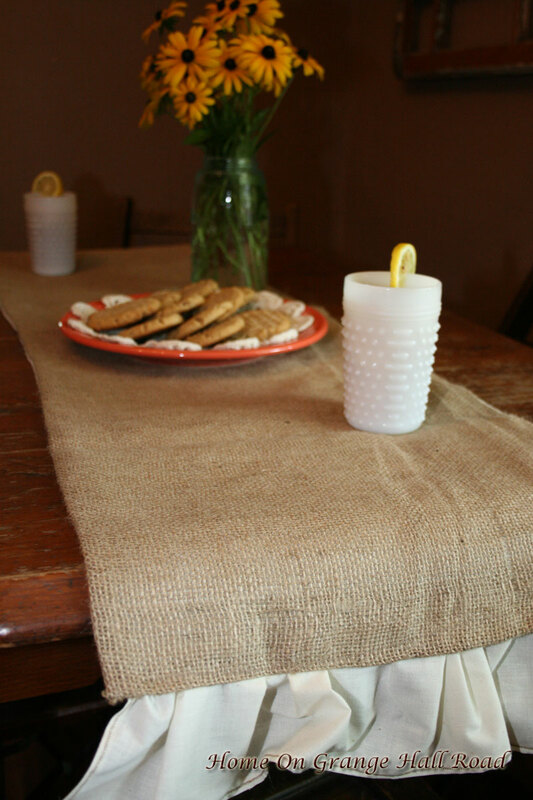 This burlap table runner is backed with unbleached muslin with a matching muslin ruffle. It is reversible! When we were brainstorming for ideas for SistersCg, we knew from the very beginning that all our items would be handmade and when we discussed fabrics we kept coming back to burlap. 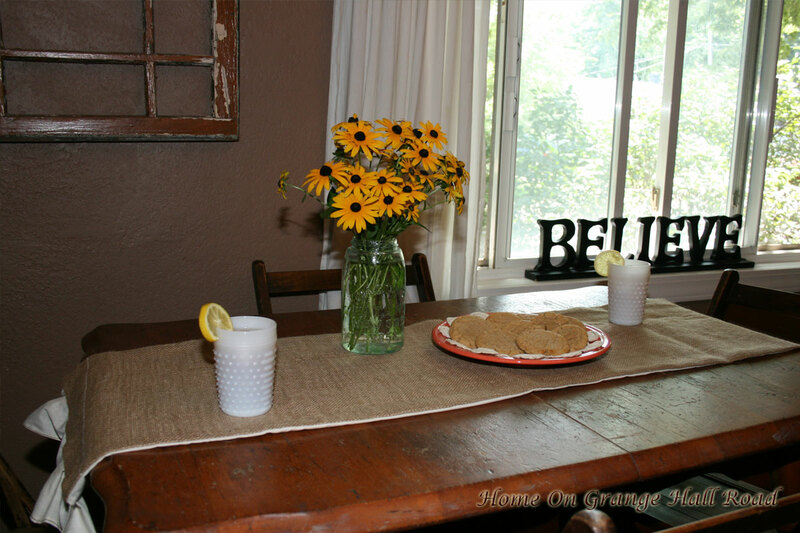 We love the natural, primitive, and country look of burlap. These table runners are so versatile and can be made to complement any decorating style. 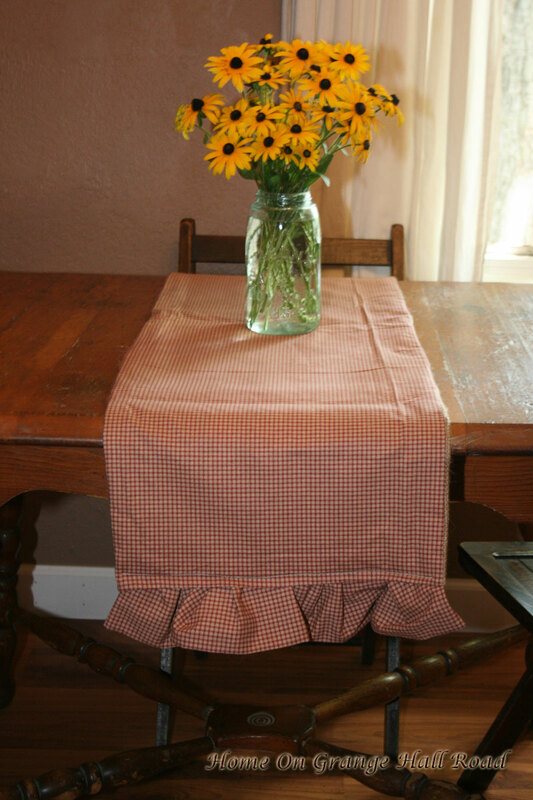 This table runner is backed with a country checked material with matching ruffle. It is also reversible. And here is another table runner with a single ruffle. Our table runners can be special ordered in a variety of sizes with coordinating backing and trim. 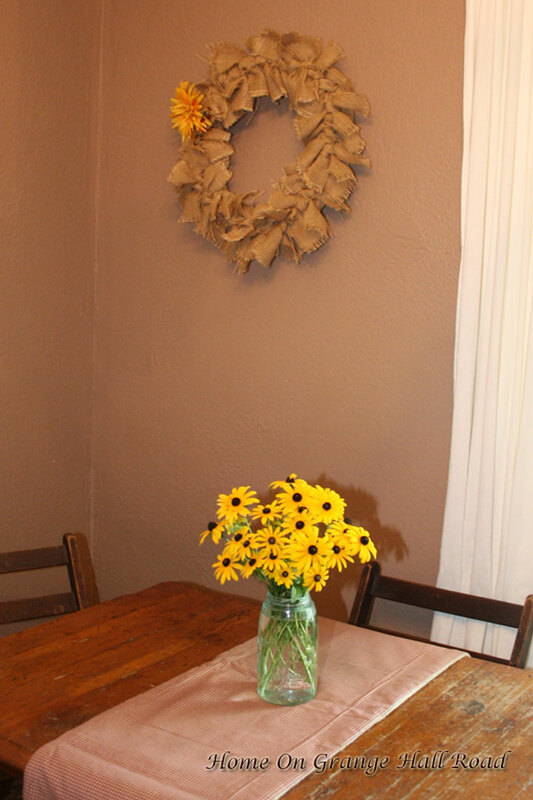 The burlap wreath is another item offered by SistersCg. The flower on it can be removed and replaced with a seasonal decoration. We will show you the same wreath with different decorations in upcoming posts. The great thing is you can use it all year long. Contact us or visit us on Facebook if you would like more information. 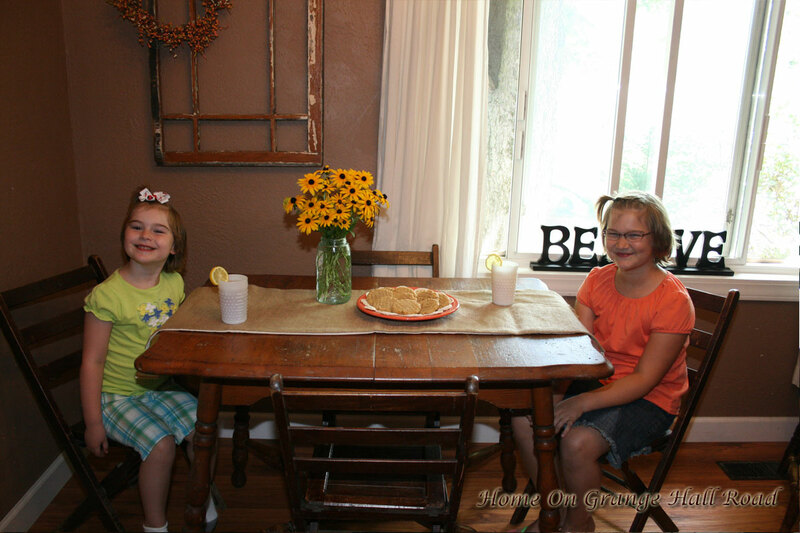 We couldn’t resist a picture of our best helpers – Pat’s precious granddaughters – Lainey and Ella. Thanks for stopping by. We hope you enjoy visiting my kitchen and seeing some of the wonderful items offered by SistersCg.